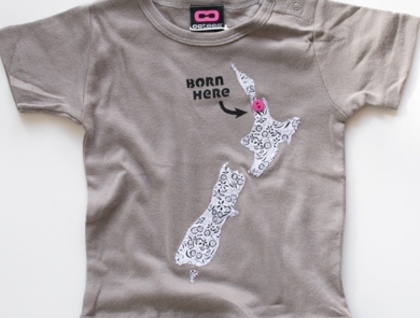 "Let your kids be patriotic kiwis with this super cute Born in NZ tee, hand-created from a mix of applique and screenprinting. This listing is for a 12-18 month size custom tee in the colours shown, so your bub doesn't have to be born in Auckland. When you order let me know where your bub is born... be it Bluff, Kaitaia or anywhere in between! Also choose button colour... blue, green, pink or black.